At Horizon Plumbing, we service all types of water heater models covering both tanked and tankless units, for both gas and electric-powered homes. While we’re proud to work with all models, it’s worth noting the excellence of Rinnai water heaters, especially in the Dallas/Fort Worth market. These water heaters have gained popularity across North Texas, and it’s worth doing a little examination to understand why. Considering that our technicians regularly service these models, Horizon Plumbing has above average insight into what sets Rinnai water heaters apart from the competition. Rinnai leads the industry for many reasons, including their exceptional customer support, generous warranties, and innovative products. 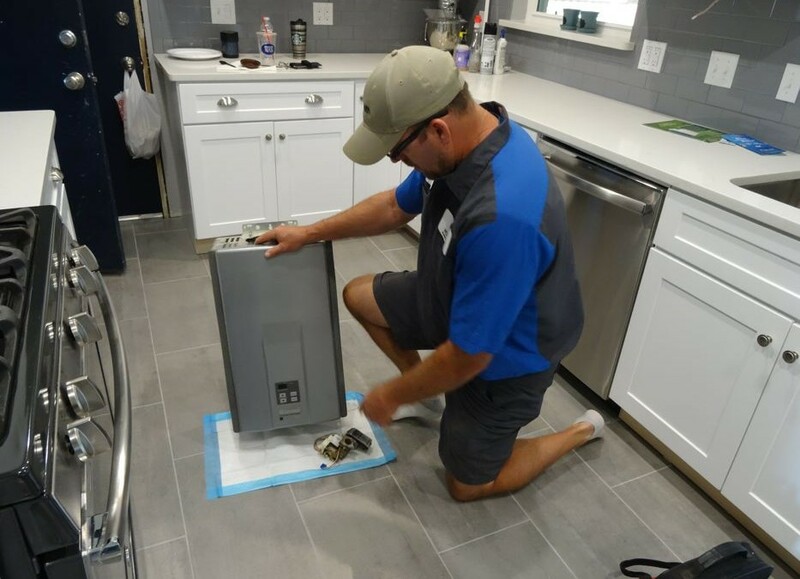 In this article, we’ll review these reasons and more to show why Rinnai heaters are leading the industry, especially among home and business owners in Dallas/Fort Worth. Rinnai possesses superb customer support and provides customer-friendly warranties. The Rinnai Ultra Series: providing the most energy-efficient performance of the tankless series, the Ultra Series is suitable for commercial applications. It’s able to meet multiple, simultaneous hot water demands. These units are available in two sizes. The Rinnai Luxury Series: perfect for a larger home or a light commercial use, the Luxury Series is a non-condensing unit that packs an energy-efficient punch. These units are also available in two sizes. The Rinnai Value Series: a flexible solution for small to medium-sized homes, the Value Series is certified for use in modular and manufactured homes. These units are available in three sizes. Rinnai provides tankless water heating solutions for a wide variety of applications. Even within each series, a range of sizes provides the necessary flexibility for Rinnai’s products to meet a range of water heating needs. From a small home to a business with extensive heating needs and everything in between, Rinnai has a heater that can fit the bill. This is a large part of why they lead the marketplace; they’re committed to providing suitable products for a variety of important customer segments. What does an “innovative water heating and home heating gas appliance” look like? One example is an innovation called Rinnai Circ-Logic. This innovation comes standard on the Rinnai Ultra and Luxury Series units. But what makes Circ-Logic so special? Energy Efficiency: Since Circ-Logic enables homeowners to adjust settings based on their needs, it results in improved energy efficiency. For example, by switching the heater to Economy mode, the pump will be cycled less frequently, which helps the unit maintain the desired temperature with less energy usage. Greater Durability: As you might imagine, because Circ-Logic enables you to adjust your heater’s settings, the heater undergoes less wear and tear. This results in an even longer shelf life for the unit. Improved Comfort: For extra comfort, Rinnai customers can enable Comfort Mode, which will ensure that the circulation loop’s temperature stays high. This commitment is exemplified in Rinnai’s efforts to go the extra mile and achieve ISO 9001 and/or ISO 14001 certifications for all the factories where their products are manufactured. ISO 9001 and ISO 14001 are both independently audited. Additionally, ISO 14001 is proof that an organization is achieving the intending results of its environmental management system. These results benefit the environment, the organization, and other interested parties. Pursuing these certifications requires time and resources, but Rinnai is an industry leader because of its long-term commitment to excellence. In fact, in addition to these certifications, Rinnai products that are distributed in North America have also been approved by the Canada Standards Association and the American National Standards Institute. Rinnai’s North American operations started in 1974 and, even today, they are still expanding. Recent additions to their North American presence include a distribution, research, and training facility located in Peachtree City, George and several training centers in California. But long before 1974, Rinnai was helping its customers by creating innovative solutions to home heating problems. According to the Rinnai’s website, over 30 million Rinnai tankless water heaters had been installed throughout the globe. Yet Rinnai’s long history of service goes beyond selling great products. Their commitment to service is exemplified in their industry-leading warranties and their professional service which is available at all hours of the day, all year long. By providing exceptional, durable products that can fit a wide variety of customer needs, Rinnai has set itself up well to lead the industry, especially in Dallas/Fort Worth. Specifically, the Rinnai Value Series is suitable for small to medium-sized homes, while the Ultra Series meets the needs of businesses. Rinnai heaters are designed so that businesses with a large demand for water can combine multiple heaters to suit their needs. So while you could choose to focus on the unique features that Rinnai heaters provide, the simpler reason Rinnai is leading the industry boils down to their flexibility, reliability, and customer-centric approach.